Heaps of supporters with authentic, quality subscribers have agreed to send out one email on Tuesday, October 16th, 2012 announcing the freebie-loaded HOW TO GET ANYTHING YOU WANT – JUST LIKE THAT! Amazon.com book campaign. I am planning to reach 1 million+ people on campaign day. A few days before the campaign day Tuesday, October 16th, 2012, I will supply you with the email to send. It will contain a compelling introduction to the 24-hour time-limited offer, and a link to my book’s special offer page that will have the simple purchasing instructions. It will list the many attractive bonus gifts the buyer will receive when they make their purchase in that 24-hour period on Tuesday, October 16th. Thrill your subscribers: Your subscribers will be delighted that you let them know about the promotion and the phenomenal gifts. These opportunities are rare and once they’re gone, they’re gone. You and your website will be listed on the special offer page, even if you do not have a gift. Massive Exposure: You get massive exposure on Tuesday, October 16th to a very targeted audience. Traffic to your site: The bonus gift will drive increased traffic to your website. Increase your subscriber list: You get the opportunity to increase your subscriber list when the customer opts-in to download your gift. Visibility for other products: You have the opportunity to get more visibility for your other products and/or services. Zero cost: Your bonus gift doesn’t cost you anything, as it is downloadable. Holiday Season is approaching: get free visibility to millions of people who are already in the buying mode. A bonus gift can be any quality electronic product with real value (eBooks, audio recording, recorded trainings, interviews, eWorkbooks, webinars, videos, software), a few chapters of a book, consulting or a discount that you would like to include. Your name and bonus gift would be listed on the special offer page and receive enormous visibility because it will be sent to hundreds of thousands and possibly millions of people. Ideally I am looking for “e” products, because they are downloadable at no additional cost. If you have one or are going to create one, I’d love to consider it. Customers would click on a link you specify and be directed to your site and opt-in to download your bonus gift. Agree to send a solo email to your list – that’s all. On Tuesday, October 16th. As mentioned above, you may choose to include a bonus gift and if you want to you can promote the campaign through your newsletter, blog, Twitter or Facebook (and/or any other type of promotion.) The copy for all of these will be provided for you. 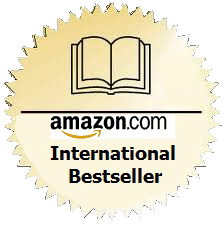 “An excellent book which can and will help you change your life for the better. “The book is easy to read, hard to put down at times, in fact. 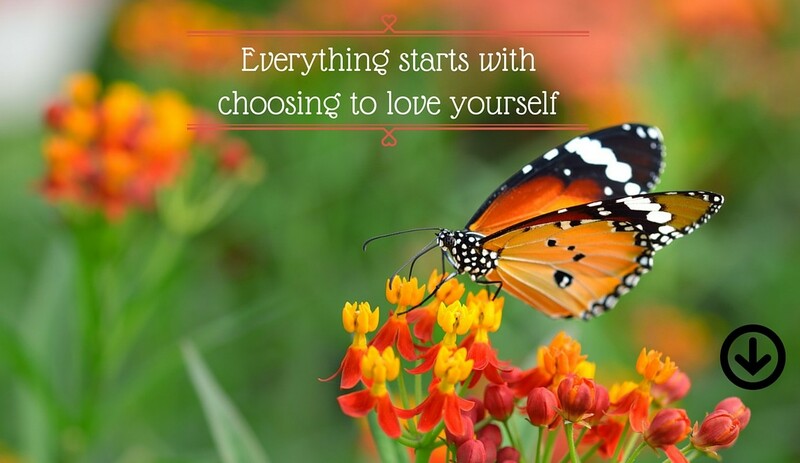 Do You LOVE YOURSELF THE WAY YOU ARE? Why are some people happy with very little, while others are miserable in paradise? While traveling and working in several different countries, award-winning author Janet Poole found herself on a mission to solve this human mystery. She did so by avidly studying people and their behavior and reading widely. 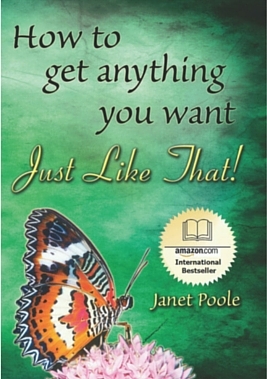 Now, Poolebrings together a lifetime of study in her new book, HOW TO GET ANYTHING YOU WANT – JUST LIKE THAT! This book was created to be a one-stop resource for understanding life. Poole’s answers are liberating, empowering and have made her one of the happiest people she knows. Scientific evidence proves we are so powerful that every day we are each creating our own world. It is our choice to either wreak havoc in our lives or create anything we want just as easily. The evidence sadly remains largely hidden, and most people consider themselves powerless. Most still believe in luck and fate, and think they have no choice over how their life turns out. ~~ Stop trying to be what they’re not — and discover who they really are. ~~ Decide what they truly want, rather than what society thinks they should have. ~~ Leave behind the herd mentality and become a confident leader of their life. ~~ Walk away from guilt. ~~ Turn tough economic times into fulfilling opportunities. ~~ Become increasingly attractive to their partner without even trying. ~~ Learn to look in the mirror and see a smart, beautiful person looking back – someone who deserves the world. This inspiring author offers her readers warm encouragement, wise advice — and a step-by-step recipe for creating an extraordinary life. 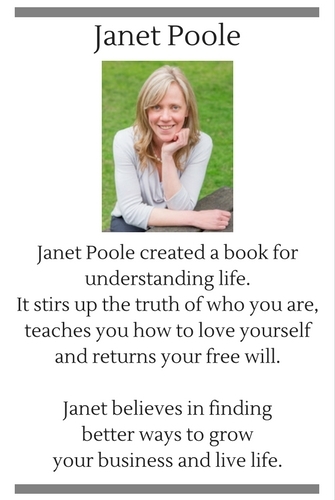 Janet Poole’s mission is to inspire people to live an extraordinary life on their own terms, to reach their full potential and to wake up enthusiastic about their day every day. 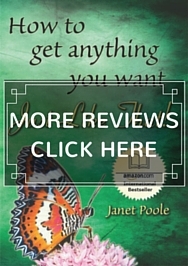 Janet’s debut book, How to Get Anything You Want – Just Like That!, is receiving rave reviews. It won awards in three categories of the 2011 Reader Views Literary Awards, was a finalist in the 2012 National Indie Excellence Awards and won a 2011 Pinnacle Book Achievement Award. Since early childhood, Janet’s life has been an adventure, mostly fabulous but with its fair share of challenges – which, of course, generated the greatest learning and growth. She has followed many alternate paths in her quest to understand life, including quantum physics, neuroscience, the link between brain-body-emotions, Neuro-Linguistic Programming (NLP), Taoism, Masters of the Far East, Eckankar and nutrition. Janet was born in Durban, South Africa. Her initial career in Information Technology took her first to England. That gave her the opportunity to travel around Europe and work on a Kibbutz in Israel. Janet was offered a contract in Australia, where she has lived for 23 years with her husband and her two children.